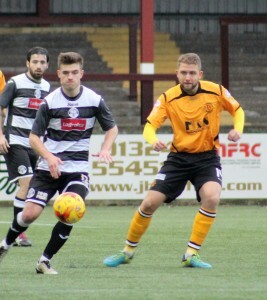 A late winner from substitute Adam Asghar earned Annan a place in the third round of the Scottish Cup and the time of the goal left East Stirlingshire with no time to respond. It was an inspired substitute by Annan boss Jim Chapman who has restricted the midfielder to sporodic appearances to date but his 87th minute introduction was the major influence on the eventual outcome of this cup tie. Both teams lined up almost exactly as they had in the first round match at Galabank the previous week with the exception that Annan’s Raffi Krissian replaced the injured Steven Black at the centre of the Annan defence. The Shire were defending a six game unbeaten home run going back to early August and they had won their last five home matches, Annan Athletic however had already won at Ochilview this season with a 2-0 victory in the Betfred Cup in July so the venue had no fears for the Black and Golds. The opening 30 minutes were evenly contested with both keepers being tested on several occasions but neither keeper looking like conceding, the first clear cut opportunity came in the 26th minute when the best move of the match saw The Shire breaking from defence in a swift move which ended with Kris Faulds with a clear one on one with Annan keeper Blair Currie but the final effort went agonisingly wide of the target .It was however a warning for Annan which exposed their lack of pace at the back. Captain Derek Ure tested Blair Currie moments later but on the half hour mark the deadlock was broken when The Shire took the lead with a well executed goal. Ex Peterhead player Andy Rodgers was the creator when he set up Paul Sludden who drilled the ball into the net from 12 yards. It was an excellent goal which saw Annan having to come from behind for the first time this season. The lead lasted 5 minutes and it was a well worked Annan goal and ended a good build up which concluded with Rabin Omar laying the ball back to top goal scorer David McKenna who’s well placed shot from 22 yards clipped the inside of the post with keeper Jamie Barclay well beaten. The home team were unlucky in the 38th minute when Derek Ure’s shot struck the top of the cross bar. Annan were being pinned back as the home team pressed forward and Blair Currie had to deal with an Andy Rodgers effort as the match approached half time. The Shire started the second half pushing forward but efforts from Rogers and Grant did not look like beating Currie. The home fans were screaming for a penalty to be awarded in the 50th minute when Krissian had to deal with an awkward ball but the referee was perfectly placed to dismiss the claims. Annan had a real let off when David Grant cut along the bye line slipping past the challenge of Krissian and sending in a low cross in front of the goal which only needed a touch. It was a conserted effort by the home team but Annan were defending deep. As the game progressed both teams made changes but it was not until late on that the game swung dramatically in Annan’s favour. Goal keeper Blair Currie was to thank when in the dying minutes he pulled off the save of the match to deny Andy Rogers who homed in on goal only to watch in despair as the Annan keeper pulled off a fine save pushing the shot for a corner. From Kris Faulds’ resulting corner Currie again came to the visitor’s rescue blocking Liam Allison’s net-bound header on the line with an outstretched leg. Annan then forced a couple of corners at the other end and from the final corner the ball was flicked on to substitute Adam Asghar who’s well drilled low shot flew into the net through a number of shire legs from 12 yards. The shire players argued that Andy Rodgers had been fouled by Krissian as the corner came over but the referee dismissed the claims and allowed the goal to stand. It was the winning goal in a cup tie which could have went either way and it was cruel for the home team who had gave as good as they got over the two games. Annan now face a difficult away tie in the Third Round to play Highland League team Formartine United on the 26th November. It is a tasty fixture but the prize for the winner could be very rewarding. ANNAN ATHLETIC : Blair Currie, Raffi Krissian , Steven Swinglehurst, Ryan Sinnamon, Peter Watson, Barry Cuddihy, Rabin Omar (Adam Asghar 87 min), Ryan Finnie ( Przemyslaw Dachnowicz 90 min) , David McKenna ( Max Wright 60 min), Jean Guy Lucas, Darren Ramsay. Substitutes not used Alex Mitchell, Aaron Bradbury, Stephen Bronsky, Callum Home. EAST STIRLINGSHIRE :Jamie Barclay, Graeme McGregor (Adam Murray 90 min), Liam Allison, Andy Grant, Connor Greene, Simon White (Jamie Glasgow 80 min ), Andy Rodgers, Derek Ure, David Grant , Paul Sludden, Kris Faulds, Substitutes not used Dean Shaw GK, Dylan McGuigan, Connor Hogg, Adam Murray, Drew Ramsay, Lewis Peddie. REFEREE: Alan Newlands, Assistants Sean Carr and Chris McTiernan.